In the sixteenth issue of The Present Group, artist Rebecca Blakley sneaks a contemporary coming-of-age tale into “the novel that defined a generation”. 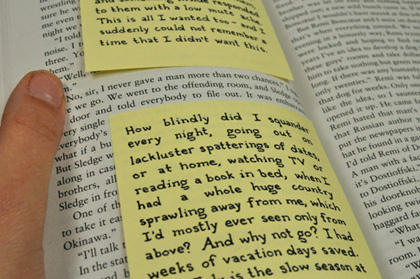 “On the Road” is an edition of 70 copies of the classic novel by Jack Kerouac containing a parallel story told by Blakley via Post It notes hand drawn in Times New Roman. Rebecca Blakley is a native of Santa Barbara, California, who has recently moved to Oakland, after an east coast stint involving Baltimore, Maryland and Brooklyn, New York. She double majored in art and English literature at University of California, Los Angeles, graduating in 2003. Although she has exhibited paintings in such venues as Maryland Art Place and the Baltimore Creative Alliance, her recent work has focused on producing art that the viewer encounters in unexpected places.